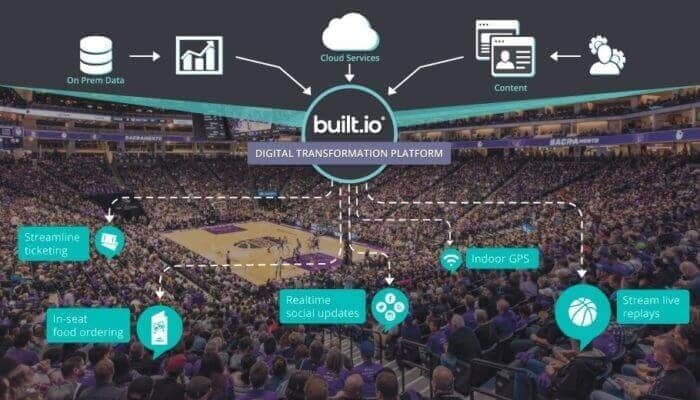 Technology provider Built.io has revealed details of a new service designed to improve the experience of fans visiting sporting events. The Digital Fan Experience Platform combines three of Built.io’s products and services to help sports teams interact digitally with supporters. According to Sporttechie.com, sports clubs can use an application development platform to build a mobile or web app, while a content management product will separate content from code. Built.io said this set-up will enable teams to manage content across a number of platforms. In addition, sports franchises will benefit from an integration service with access to numerous APIs and can connect with various devices such as a beacon, sonar or drone, as well as chat bots, virtual reality and augmented reality technologies. Chief executive Neha Sampat said that Built.io can offer teams a “whole ecosystem of partners” that it considers micro-services within the sports industry, from ticketing companies and in-seat ordering platforms to navigation tools, that deliver an “end-to-end solution” to the team. Sampat said the new system will allow teams to offer fans more of a VIP experience by providing tailored and customised apps. Some of the technologies featured in the new service have already been used by NBA basketball teams the Miami Heat and Sacramento Kings.